Genealogists, like archivists, handle original records that are historical, genealogical, and many times, rare. The preservation of these records is the number one job of an archivist and should also be important to genealogists. Original genealogical and historical records are important to preserving our collective and individual histories. Documenting family histories with these types of records is very important and cannot be done if the records are not cared for properly. This guide is for anyone interested in preserving family records for the next generation to enjoy. The Metal Paper Clips, Rubber Bands and Tape, OH MY! 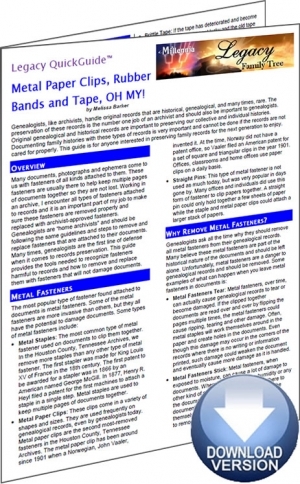 Legacy QuickGuide™ contains useful information including a review of the most damaging types of fasteners and instructions on how to remove them as well as resolve any damage issues. Also included are links to websites and resources covering resources and supplies. This handy 4-page PDF guide can be used on your computer or mobile device for anytime access.